Thanks to an economic recovery, an improving job market, lower gas prices and rising home values, people are feeling better about opening their wallets and spending more. And, thanks to the urge to splurge, people are spending more on travel. Indeed, the 2015 summer travel season is on pace to become the busiest in U.S. history, according to a new report from airline and travel experts at Booz Allen. The global consultancy came to that conclusion after analyzing more than 4 million airline tickets purchased for travel between Memorial Day and Labor Day. While that’s great news for the travel industry, it also means that fewer award seats are available to travelers attempting to use their loyalty points. And that trend is expected to continue indefinitely. Booz Allen found that as airlines increasingly use complex systems to optimize their operations and revenue, customers will find fewer deals because of higher traffic volumes. In addition, the report said that today’s airlines are not only experiencing much higher volumes of passengers, but passengers are demanding higher quality and improved service. In this digital age, when everyone is always plugged-in, travelers have become ever more demanding and fickle. The 2015 U.S. summer travel season is expected to see an average 2.4 million travelers flying daily, up 4.5 percent from last year, and hitting an all-time high. The top 10 U.S. international nonstop destinations by total seats scheduled by day are: Canada, Mexico, the United Kingdom, Germany, Japan, France, the Dominican Republic, China, South Korea and Brazil. 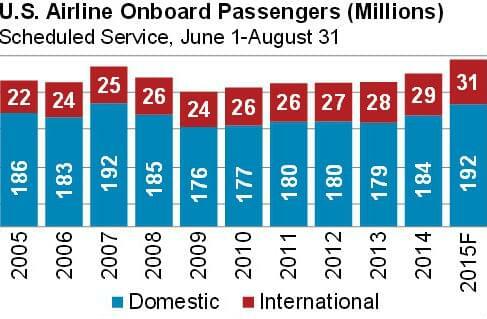 Airline booking trends have shifted by one week over the past year, resulting in earlier competition for seats. 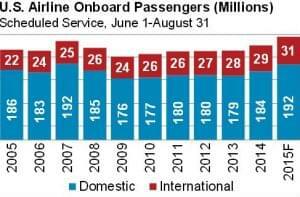 A 2 percent increase in load factors has resulted in window and aisle seats being grabbed, on average, three days earlier this summer than last summer. It’s 34 percent less likely that a middle seat will remain empty, when compared with last year. Despite a rapidly growing base of over 2 million members in the U.S. Customs and Border Protection’s Global Entry fast-track program, customs wait times are 10 percent more likely to exceed 30 minutes as compared with last year. The report concludes that early planners will prevail in this new pioneering era of travel. Procrastinators, meanwhile, will pay in both time and money. So when it comes to flying now and in the future, the proverbial early bird will catch the worm and that means booking award tickets sooner rater than later.